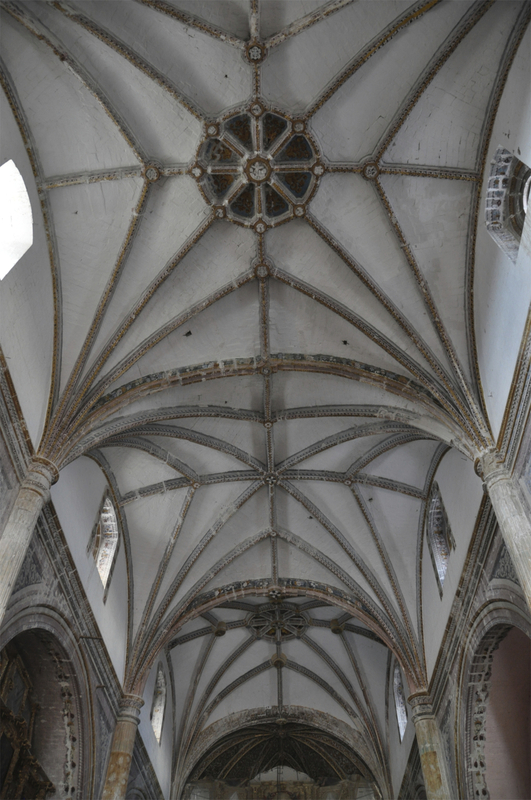 This vault can be categorized as the most “Gothic” of the three, this is because its overall geometry is the result of the constructive process instead of following a shape preconceived by the designer. The church of San Juan Bautista Coixtlahuaca, built in the second half of the sixteenth century, is a church with a single nave, i.e. one long space. The design of Coixtlahuaca’s church was resolved with four modular 12.5 meters-length squares and a half octagon apse. The mass of buttresses in this church is built towards the interior of the church forming a series of arcs on the sidewalls which supported small shrines. These small chapels helped the monks organize the indigenous communities into different brotherhoods who would adore a saint placed in each of these chapels. Churches were used as a more traditional strategy for evangelization in the sixteenth century and this church was one of them. The single nave was widely used in Mexico during this period for many reasons. A basilica requires columns; the main idea of he single-nave church was to build a "box". This “box” type of building was easy to draw on the ground, had a clear layout, and did not create many complications through the construction process. It did not require high levels of expertise to build the walls of this type of building. 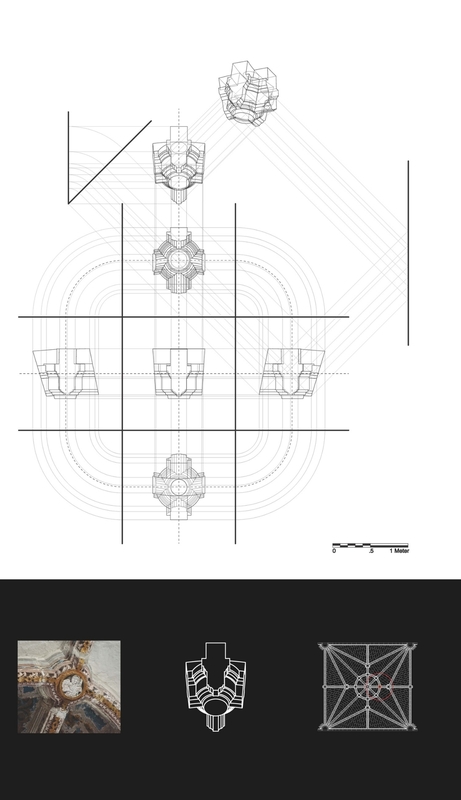 In order to draw the vault of Coixtlahuaca on a horizontal projection (plan) one should begin with the delineation of a square. The tiercerons would then be defined by drawing a triangle whose vertices coincide with two corners of the square and at the midpoint of the square’s opposite side. These lines draw the path of the tiercerons to the point where they intersect one another. At this point the important arches of the vault are defined; now one should find the radius of the ring at the center. This is done through a simple operation. One should take the intersection point where tiercerons connect each other and, using this intersection as the vertex for a new triangle, draw two lines to the corners of the initial square. This operation draws an equilateral triangle whose sides are equal to the initial square. The circle at the zenith of the vault simply finds its center at the converging point of the diagonals (keystone) and it is tangent to the sides of this last equilateral triangle. This panel shows the underlying geometry of Coixtlahuaca’s vault on the vertical projection or elevation. 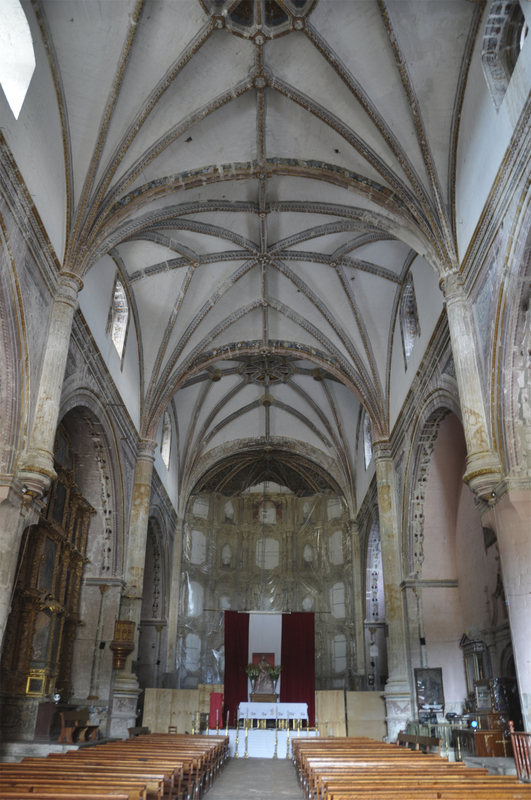 First, one notices that the transverse arches are half of a circle that spans the width of the nave. The multiple sections performed in the digital environment revealed that the portion of the vault within the ring, at the zenith of the vault, defines a horizontal line. This means that the diagonal arches do not span across the entire vault because the flat zone at the ring interrupts them. This solution is comprehensible since the ribs’ molding describing the ring needed to be vertical; otherwise they would define a cone, which would be very difficult to carve. 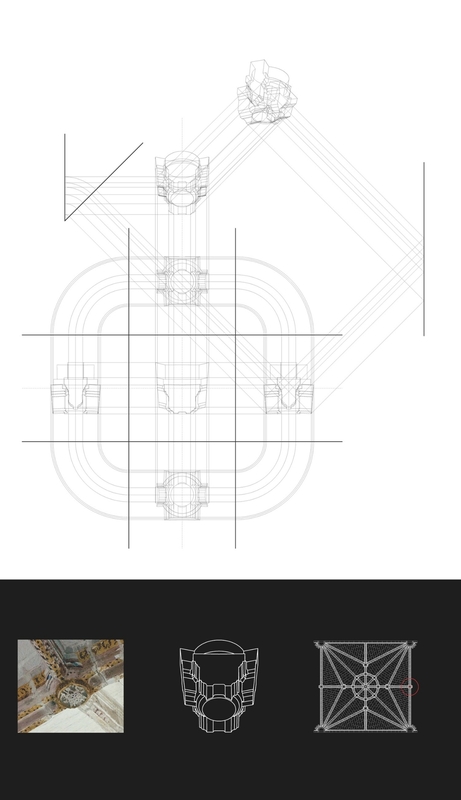 This simple construction restriction sets the way in which the diagonal arches are going to be drawn, which is based on two quarters of circles instead of a single arc diagonally across the vault. All arches of this vault were drawn applying a similar process by using quarter-circle arches; i.e. 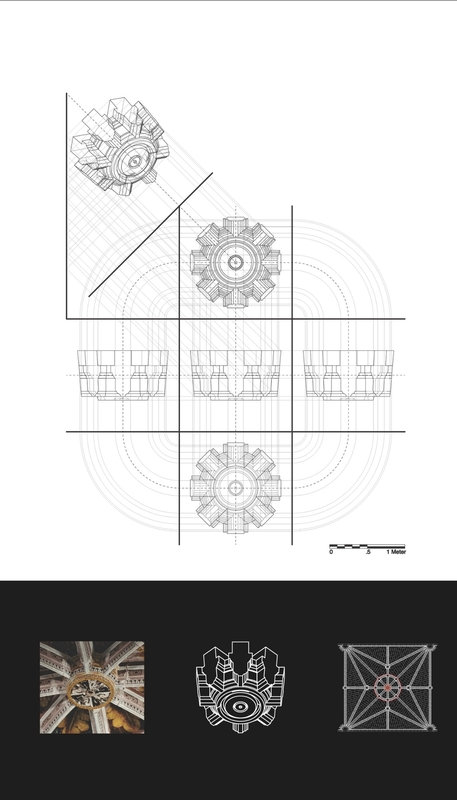 were drawn individually and not responding to an overall geometry. 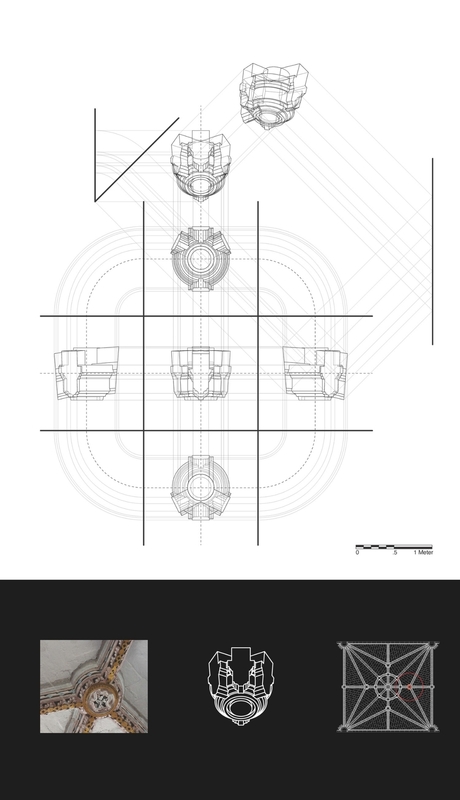 Finally, the ridge ribs do not follow a continuous curve but simply connect the points across the vault. 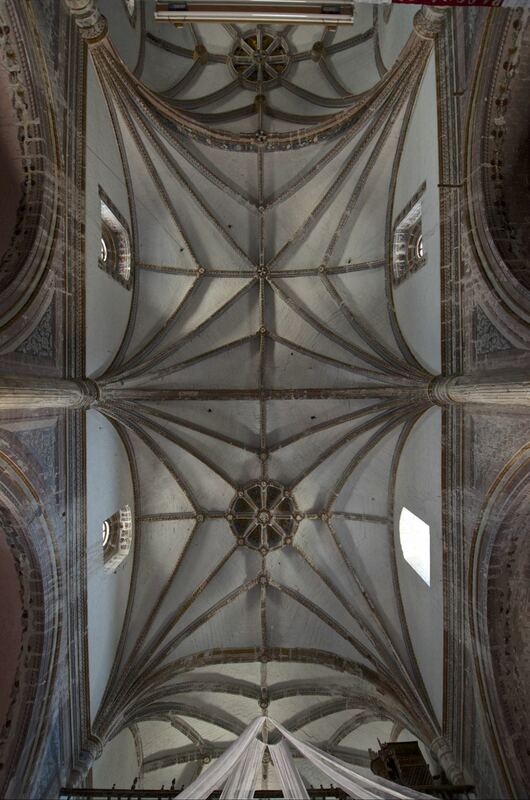 The vault follows the precepts of Juan de Ayala (Spanish master builder of the sixteenth century) using the same sectional dimension of each rib, except for the transverse arch which is thicker. The voussoirs of the webs in Coixtlahuaca vaults are similar to those found in England. (A voussoir is a wedge-shaped stone used in arch construction.) 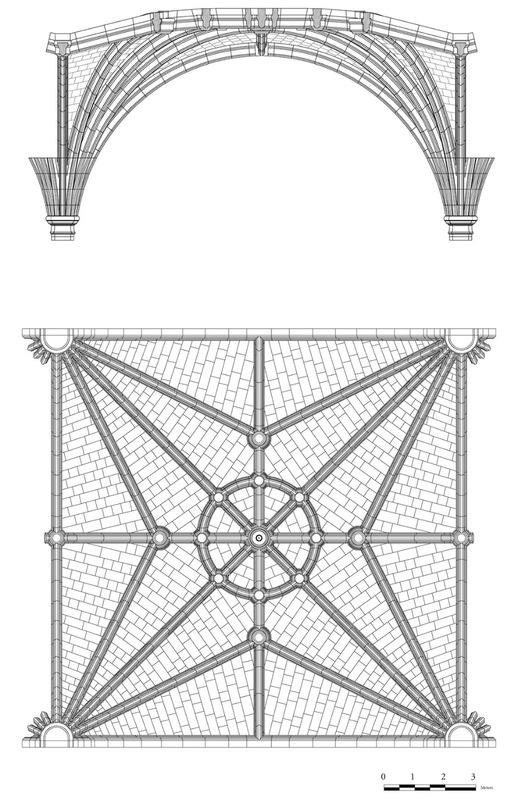 The voussoirs’ coursing runs perpendicular to the bisectrix of the angle between ribs forming a “fan vault” style of dome. As to the bosses and keystone, Coixtlahuaca’s ribbed vault presents four arm pieces and an eight-arms keystone, all of them with a vertical axis due to their position on the vault (near the zenith) and the type of intersection that generated between the ribs.